BLOGS | Australian Social Dance Network | Preserving and promoting Australian social dance. Preserving and promoting Australian social dance. As experienced dancers we all want to encourage and help others to join the dance, be successful, and enjoy themselves. Sometimes this is not as straightforward as it might seem. Community dances attract a wide range of people with different levels of ability and experience. Dances don’t always go exactly as planned – relax, dance well, and be cheerful. This entry was posted in Uncategorized on April 5, 2019 by earlycolonial. 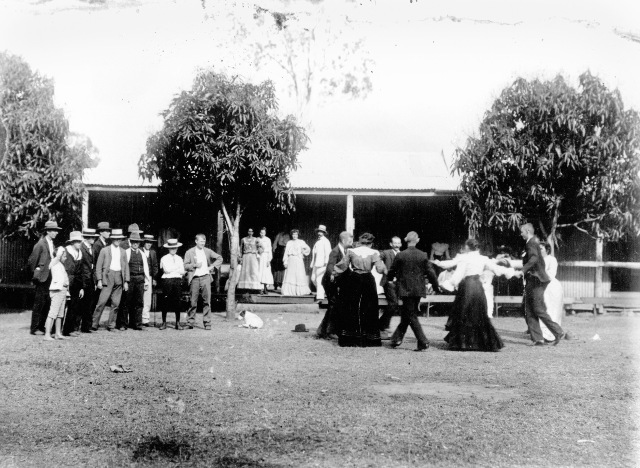 Early social dances in Australia reflected its situation as a frontier country established by expatriates who were thirsty for word from “home”. In terms of dance, this meant that people literally queued at the harbours waiting for news of the latest fashionable dances and music. Perhaps it was to counteract the harsh realities of the new colony that the dances and music of the ball-room were rapidly established here. So it was the dances of the aristocratic country houses rather than those of the village green that were taken up, or at least made their way into documented history. Even the English country dances, although seen as having a rustic origin, had in the main been invented by the dancing masters for society rather than for the common folk. Although the lower classes may have indulged in some of their surviving folk dances they were generally illiterate and little survives to tell of this. The literate classes seldom wrote of anything of interest (to us) below their station. We do know the Industrial Revolution had a profound effect on jumbling country folk together in the cities and that they tended to learn the new fashionable dances from the ‘dancies’ the itinerant dancing teachers. The new Waltz arrived in Sydney just after the battle of Waterloo (1815) and was the immediate preoccupation of the population, except for Governor Macquarie, who detested it and ensured the Scottish reels were to be favoured at official functions. Quadrilles or in particular “The Quadrille‟ from France had arrived in Britain after the Napoleonic wars and “quadrille mania‟ was all the rage; it was established in Sydney about 1820 with a special Australian musical theme arranged in 1825 for five dance figures: La Sydney (first figure); La Woolloomooloo; La Illawarra; La Bong-Bong; La Engehurst (fifth figure). The speed with which new dances from Europe established themselves here was surprising given the distance and difficulty in communication. The Polka is listed on a Goulburn dance programme in the same year as its English launch in the London Illustrated News. The gold-rushes of the mid nineteenth century attracted a mix of many cultures from Europe, North America and China. This augmented a trend that was already entrenched in the dancing establishment of adopting dance styles from other countries. Couples dances such as the Varsoviana, Schottische and Polka Mazurka were here by the late 1840s along with the Lancers Quadrille; again arriving as the latest fad rather than a folk dance reflecting the cultural background of the peoples who were flocking to Australia. Many of these new dances were not from the British Isles, but rather of European origin. Although arranged as dances of the ballroom they had developed from various folk and national dances. Generally they were “taken up‟ by dancing masters, launched at Paris and then came via London to Great Britain and Ireland, Australia and the other British colonies and America. The tunes for these dances were generally classically composed but often had their roots in traditional folk music. In the capital cities and larger towns of each of the colonies dancing was one of the pillars of social life. At that time it was one of the only ways to facilitate contact between the sexes. Balls were regularly held at Government House and it was a mark of one’s status to be invited. We know from the records of a ball in Bendigo that Queen Victoria’s two sons were partnered in an opening double set of the First Set (The Quadrille) by the Lady Mayoress and a local councillor’s wife. Everything was prim and proper and run by the book and you wouldn’t want to be caught putting a foot wrong. Balls were held everywhere and there were no special practices or classes. Those attending knew all the dances of the day. The rapid spread of colonists into the countryside and the development of farming and grazing led to the establishment of villages and towns. An important aspect of this was the local hall, be it a School of Arts or a Mechanics Institute, for regular local dances. Even these dances were conducted in an orderly fashion and the MC was an absolute “boss cocky” and the controller and organiser of the evening. A typical dance programme consisted of a mixture of couples dances (Waltz, Varsovienne, Polka) and sets of couples dancing together (Quadrilles, Circassian Circle, Scottish Reel and Irish Reel). The arrival of couples dances such as the One-Step, Foxtrot, Quickstep and the Slow Waltz in the early 20th century eclipsed the older ballroom favourites. These new dances became the rage in fashionable ballrooms, hotel lounges (the Tea dance) and house parties across the land. The set dances, such as the Lancers and other quadrilles, fell out of fashion and were maintained mainly by small pockets of dancers in the countryside – the “bush”. Here tradition survived for another generation or two, aided by the MCs who restricted the frequency of modern dances. There was a revival of “old time” dances in the cities and towns in the 1930s. However many of the teachers were not familiar with the old dances or could only poorly reconstruct them. There are many variations of the lesser-known quadrilles and couples dances like Princess Polka, Heel and Toe Polka, Schottisches and Mazurkas that have been collected. It is likely that although they have their roots in the 1890s they have developed more individuality in the early 20th century. These same dance teachers introduced ‘sequence dances’ incorrectly interpreted from English originals. Thus our Pride of Erin, Maxina, Boston 2 Step, Evening 3 Step are greatly different as well as between districts and states. New Australian dances such as the Gypsy Tap and Swing Waltz were also ‘invented’ under the newer emerging ‘New Vogue’ umbrella. Along with the flow of American popular culture after World War II came such diverse forms of popular dance as rock & roll and square dancing. The waves of migration from Europe and elsewhere after World War II led to the establishment of a diversity of cultural dance groups from countries ranging from Scandinavia, Greece, Hungary, Bolivia and many others. With the folk revival of the 1960s came bands such as the original Bushwhackers and the later supercharged Melbourne version (Bushwackers). These popularised Australian songs and included some overseas dances which led to the resurgence of “bush dance” in the 1970s and 80s. These dancers were in a form that had never existed before, much less in the bush. Collectors of Australian traditional culture toured the countryside to ensure that old dances and tunes could be rediscovered and preserved but found little that corresponded. Nevertheless, an interest in our colonial roots led to the re-establishment of regular balls, modelled after those of the 19th century, with many of the old set dances rediscovered and complete with period costume. Country dancing had been established in Scotland well before settlement in Australia and existed in Caledonian and Country Dance clubs till the present. Similarly Irish ceili dancing has mushroomed in popularity, both within their community and more widely with social dancers. The older English country dancing catalysed the development of Scottish country dance. Both have been enthusiastically embraced by the wider social dance community over the last 40 years. This entry was posted in Uncategorized and tagged Australia, Australian Culture, Australian Dance, Australian History, Ballroom Dancing, Bush Dance, Bushwackers, Country Dance, Culture, Dance, Gold Rush, History, Scottish Country Dancing on April 24, 2016 by alexbishop1. Peter Nicolaus Ellis of Bendigo (b 1946, d 2015) was an avid collector and instructor of traditional and old time social dances and the relevant music in Australia since late 1970s. He presented numerous workshops in both areas in several states and at many folk festivals including the National, Maldon, and Port Fairy. Sadly, Peter passed away early in 2015. Also a historian on the early social dance and music, he regularly provided articles and photographic material for Trad & Now. He was a member of the Wedderburn Oldtimers Orchestra (since 1979, and led his own Emu Creek Bush Band since 1983, was a founding member of the Bush Dance & Music Club of Bendigo and through the auspices of both, who work hand in glove together, produced numerous recordings of music for quadrilles, couple dances and the various country dances, including those of the ‘bush dance revival’. Much of his knowledge came from a close acquaintance with the late Harry McQueen of Castlemaine. Publications include the Collector’s Choice series in 3 Volumes, Music Makes Me Smile (music and dances of the Nariel Valley), The Waltz, the Polka and all kinds of Dance Music and The Merry Country Dance. He also made extensive collections for the National Library of Australia and his section on dance is said to be the most extensive. This entry was posted in Uncategorized and tagged Australia, Australian Culture, Australian History, Australian Music, Bush Dance, Bush Music, Culture, Dance, History, Music, National Folk Festival, OAM, Order of Australia, Peter Ellis OAM, Port Fairy Folk Festival on April 24, 2016 by earlycolonial.